I have been a curator for over twenty years, starting at various film festivals and now as the director of programming at Emerson College running a film series that I founded almost seven years ago. At its core, film promotion is like film production: the art is what’s important, but it all comes down to time and money. On the heels of our theatrical opening weekend and basking in the glow of some of my favorite reviews (like the one above from KPCC’s Film Week), I wanted to take a moment to spread some love. Every person who was part of this production made this film better by their participation, so I’m commandeering the blog to call out many of them by name and swing the spotlight onto their contributions. First up, David Lipson. David worked with me as a consultant in the early days of SADIE’s existence and read many, many drafts of the script, sitting down for long conversations with me about the characters and the story that helped me plumb the depths of Shady Plains Trailer Park. Aron Michael Thompson was one of the first people to believe in this project and gave a critical infusion of support in the earliest stages, when we truly needed it. Sue Corcoran rallied the troops in those terrifying weeks of early prep when you're still not 100% sure you're going to get to make a movie at all. And she went on to make a beautiful behind the scenes video that captures the love and hard work of everyone on set. Alix Madigan read this script back at the Sundance Creative Producers Lab in 2011, resonated with both its darkness and its message, and was a stalwart supporter through the project’s life. Rebecca Luke spent years visualizing this world as we waited for the stars to align, then brought all that forethought to bear in costume design that underscored our themes in an understated yet very powerful way. My aesthetic twinsie Ben Blankenship brought his customary gusto to building out the world, even pointing us to the trailer park where we ultimately shot, which matched almost exactly to the one that existed in my mind as I wrote. He also pulled together an extraordinary team who created a lived-in, authentic world for our actors to inhabit. Scott Larkin & Dave Drummond ran all over the region finding just the right locations to bring Sadie’s world into three dimensions. Then Scott worked through the production to land us at each spot, deploying his charm arsenal so that we were welcomed, or at the very least tolerated, by even the grouchiest residents. Gretchen Oyster kept us on track and her warm heart brought me the comfort it always does on set, even while we shot in freezing conditions. What T.J. Williams, Jr., and his team managed to do behind the camera without enough gear or hours of sunlight boggles the mind. T.J.’s deep understanding of how to get sh*t done on set was invaluable, but his ability to make me smile even in the most challenging moments was appreciated beyond measure. Cheryl Cowan kept her eye on the details and a smile on her face, her good spirits always keeping the tight quarters around the monitor a welcoming place to spend the long days. Jonathan Caso made sure we all had what we needed to get the film made without starving or freezing, gracefully making that always impossible distinction between "need" and "want." Sophia Mitri Schloss, Melanie Lynskey, John Gallagher, Jr., Danielle Brooks, Tony Hale, Keith L. Williams, Tee Dennard, and everyone else in our incredible cast brought not only authenticity and depth to each of their characters, but they also brought warmth, kindness and laughter to our chilly set. Their generosity with each other and with our whole crew truly created a family. And a special note of appreciation to Melanie, who came on board early and stuck with us as we pushed for years to get Sadie off the ground (and Mark Duplass, who made that fateful introduction). And to the parents of our young stars for raising such incredible children. Amey Rene, Megan Rosenfeld and the whole AR casting team helped us to pull together that outstanding ensemble listed above, and, with their impeccable taste, culled the very best from our talented local community of actors to round out the supporting roles. Celia Beasley sat with me for many months fretting over frames and tiny moments, marveling over performances, and being my partner in the journey to chip away to find the very best version of Sadie. Mike McCready made my teenage dreams come true by agreeing to collaborate with me on this score, and then blew right past that old hallowed version of him in my head with his generosity and commitment. Not to mention he brought in Molly and Whitney from Thunderpussy, whose radical, badass feminine energy was exactly what we were missing. Sitting in on their first recording session was one of the singular pleasures of this entire experience. Mia Bruno, Anna Feder, Ben & Katherine from Thin Pig, and Adam & Rob and the whole team at Brigade guided my producers and I through the new minefield of creative distribution with energy and enthusiasm, and opened our eyes to previously unknown ways to empower ourselves as filmmakers. Eliza Shelden made all of it possible through her giant leap of faith, and gave herself over to the experience with a stunning degree of trust, which is truly the most amazing gift you can give an artist. Her deep understanding of what we were trying to accomplish with this film and her enduring commitment to helping us usher Sadie into the world are rare traits to find in a financial partner, and have buoyed us throughout this journey. After pushing this boulder up the steep hill of development for seven years, those last few yards into production were some of the hardest to cross. Thankfully, Jennessa West came along with her confidence, effortless competence, and tireless work ethic, leaned fully into the boulder's relentless weight and sharp corners and tipped it over the summit at last. Lacey Leavitt has been on this train the longest. Before THE OFF HOURS was even shot, she read this script and pledged to get it made with me, then proceeded to take it to Rotterdam, the Sundance Institute, and the IFP conference and, despite hearing plenty of them, never took "no" for an answer. And she also joined me for the SADIE roadshow, taking our film from Seattle, WA, to New York, NY, to Maryville, TN, and everywhere in between, and engaged with audiences in the challenging and meaningful conversations we always hoped to start. 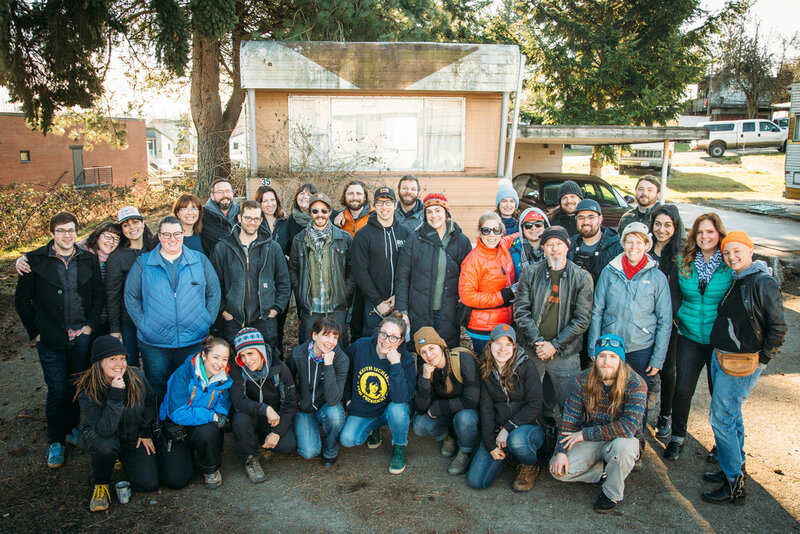 There are so many others, and every one of them made this movie happen—our incredible art department, grips and electricians (including Mike Astle, doing double-duty as key grip and the watchful eye of Sadie’s absentee dad), our crafty and catering team, our stalwart AD team and PA’s, our army of interns, and everyone who provided support on set and off. I am grateful to, and thankful for, you all. If there is one concept that I hope that every filmmaker and distributor can start to embrace it is this: Distribution is a strategy, not a formula.